Potting soil or growing media for plants must be of good quality and meet certain performance criteria. The chemical and physical properties of a potting soil determine its performance. To sustain plant growth, the medium must hold large quantities of water in a limited volume and yet maintain a high volume of aeration. Because soil in a container does not behave the same as soil in the field, potting soils are typically formulated with a high percentage of bulky organic materials such as bark, wood chips, peat, or compost. These materials hold varying amounts of water and also create pockets of air in the medium. Media usually contain additional nonorganic materials such as sand, vermiculite, or perlite, which provide additional aeration and structure. Quality potting soils should be low in soluble salts, slightly acidic (pH of 5 to 6.5), and capable of holding essential nutrients for plant growth. It is more practical to use a commercially prepared potting soil than to buy ingredients and formulate your own. However, potting soils sold though retail garden supply outlets vary widely in their performance as growing media. In California, manufacturers are required to label the product with the names of the ingredients in decreasing order of volume. Unfortunately, there are no consistent relationships between the physical and ­chemical properties of a potting soil and its ingredients list. The following recommendations help ensure successful potting. Select mixes high in bark, forest materials, or sphagnum peat with vermiculite or perlite. 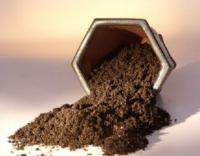 Thoroughly leach any potting soil before placing seed or plant material in the mix. Leaching will reduce soluble salts to acceptable levels in most mixes. Fertilize with a soluble fertilizer according to the manufacturer’s directions within 2 weeks after plants are growing in new potting soil to replace leached nutrients and those taken up by the plants.